On Sunday we took a ride on Greg’s and Cheri’s boat. We rode a bit up the Peace River then back to Charlotte Harbor and a little way up the Myakka River. After we passed under the bridge at Hwy 776, a pod of dolphin began to follow us. They were playing in the boat’s wake, jumping high into the air. 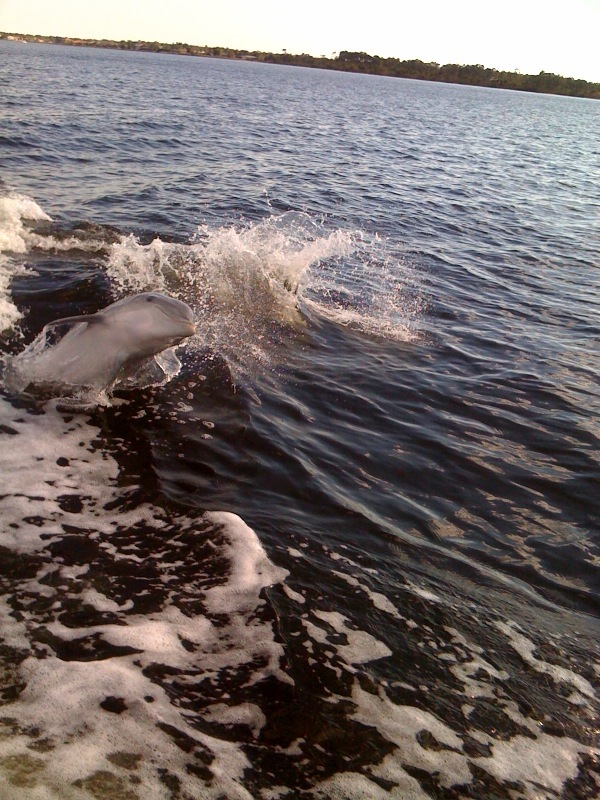 At times they were so close it seemed they could have jumped right into the boat with us! There were some other photos of two jumping together but I liked this one because the dolphin looks like it is smiling. Greg and Cheri recently relocated from New Hampshire after buying a town home in Emerald Point. They really like Emerald Point because it has a great marina, gated security, several pools, tennis and many other amenities.